When ants are spotted inside it can be a real chore to eradicate them. These resilient critters are incredibly skilled at finding your food and are very difficult to control. How much do you really know about these teeny tiny little home invaders? Here are some interesting facts about ants. Their Lifespans Vary. Queens can live up to 20 years, while worker ants usually only live for a few months to a year. Ants March with a Message. Ever wonder how ants know exactly where to go when they parade around in lines? They actually secrete an invisible trail of pheromones to guide the other ants in their colony toward a food source. This enables ants to travel up to 700 ft from their homes in search of food without losing track of their way back. Ants are Strong. You often see an ant carrying a large food crumb back to its ant hill. Because this is how they feed the others in the colony, ants are able to carry a load about 50 times their body weight. The Numbers are Staggering. There are more than 12,000 kinds of ants out there and trillions of ants on the planet. This accounts for about 25% of the earth’s land animal biomass and 1/10 of the world’s bio-tissue. They Enslave Other Ants. A number of ant species take captives from nearby nests and force these ants to work for their colony. 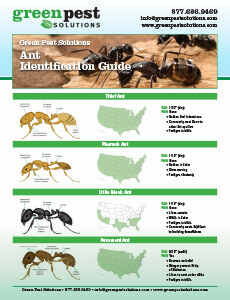 If ants have invaded your abode, contact Green Pest Solutions right away. Our staff has more than 100 years of combined experience in the pest control industry. We’ll happily come survey the problem and come up with a solution and a safe treatment program that works for you and your family. Call our team at Green Pest Solutions today at 877-636-9469.